Squads of female vigilantes patrol the 75-hectare forest at least twice a day, once in the morning, after the women finish their daily chores, and in the afternoon, after lunch. As they walk among the trees, they blow their whistles and bang wooden sticks against tree trunks, warning any woodcutters and timber smugglers foolish enough to damage this place that it’s time to leave. In 2001, over 70 women from Gundalba came together to form the Women’s Forest Protection Committee, with representation from every household. Apart from their daily patrols, they also approached neighboring villages that also depend on the forest for firewood about setting up a system to promote sustainability. For example, every village is allowed to gather firewood from the forest on a set day of the month, usually a few days after another settlement has finished the gathering process. They also spent a lot of time spreading awareness about the important role the forest plays in preventing calamities. “The casuarina trees and other species stop the salt-bearing wind from entering the agricultural land and also thwarts the advance of moisture-laden wind from wreaking havoc on farms. 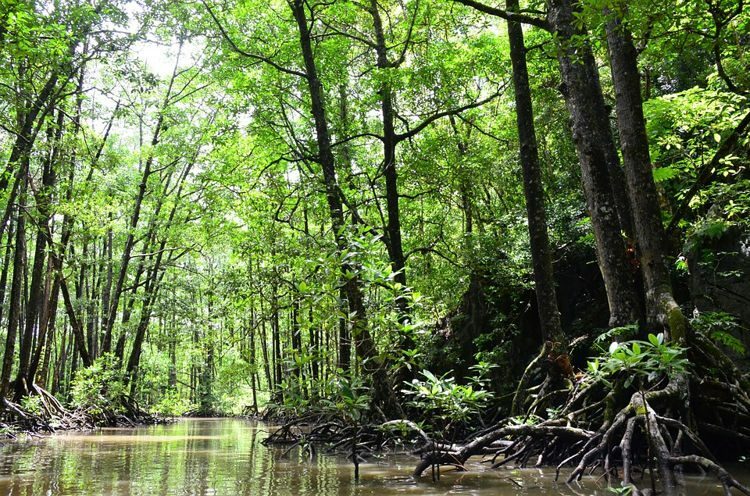 The mangroves also prevent soil erosion along the coastal belt and overall the forests preserve the wildlife,” Rahima Bibi, one of the forest guardians, said. Over the years, the vigilante squads have caught several people cutting trees illegally in the forest, and have lodged several criminal cases against them. On some occasions, they’ve had to use their sticks to threaten timber smugglers to leave, but nowadays, thanks to mobile phones, calling in reinforcements in case of trouble is easier than ever. Asked if they’re ever afraid of patrolling the large forest, the women said no, adding that they see it as an extension of their home. The women’s efforts to guard the living shield that in turn protects their families have paid off over the last 20 years. Devastated after the supercyclone of 1999, the forest gradually came back to life. Birds started nesting in trees again, then the animals returned. There are now so many deer living here that they sometimes venture into people’s fields for food. “One section of the village that is close to the forest has freshwater. This is because the mangroves and other tree species prevent intrusion of saltwater. Our agricultural fields are safe from the influence of storm surges and ferocious winds,” Rahima Bibi added.